Bruno Courrèges—provincial French police chief extraordinaire—is back in another delectable tale of mystery and suspense that unfolds in the gastronomically ravishing Dordogne. 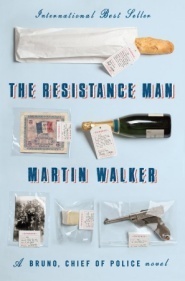 A veteran of the Resistance dies, and among his possessions are documents that connect him to a notorious train robbery. A former British spymaster’s estate is burglarized, the latest in a spree of e Bruno Courrèges—provincial French police chief extraordinaire—is back in another delectable tale of mystery and suspense that unfolds in the gastronomically ravishing Dordogne. A veteran of the Resistance dies, and among his possessions are documents that connect him to a notorious train robbery. A former British spymaster’s estate is burglarized, the latest in a spree of expert thefts. An academic’s home is broken into just as she is finishing a revelatory book on France’s nuclear weapons program. An antiques dealer is found brutally murdered, and his former lover, the number one suspect, is on the run. It’s just another summer in St. Denis for Bruno, who must balance the constant barrage of demands on his time and expertise—including the complex affections of two powerful women, town politics (the mayor is having romantic problems of his own), his irrepressible puppy, Balzac, and nights entertaining friends and visitors with ever-sumptuous repasts—with a new focus on the mounting crime wave, whose seemingly unrelated events Bruno begins to suspect are linked. His search for clues to crimes old and new leads to stunning revelations about both his country’s history and his own, and puts several more lives—including Bruno’s—in deadly danger. In a thrilling denouement that proves the past is never really past, Bruno fights to secure the future of his beloved community and those he cares about most. As charming and compelling as its hero, The Resistance Man offers fresh joys for loyal readers and newcomers alike.